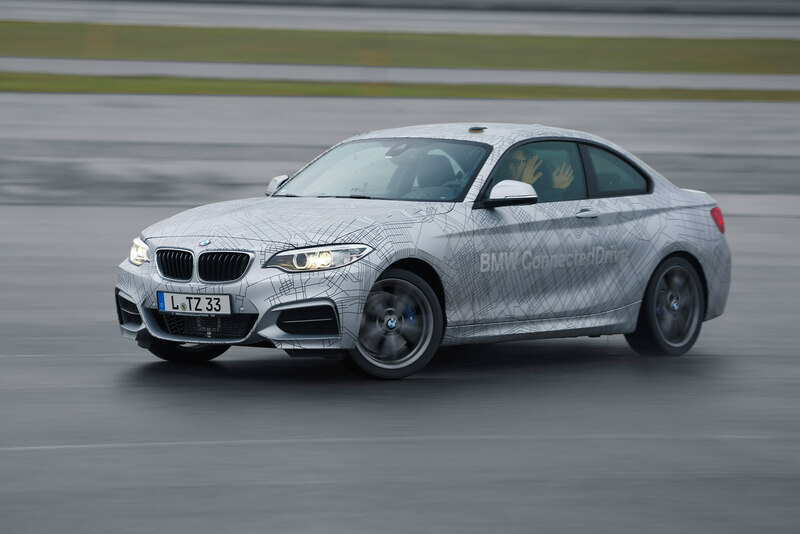 This BMW M235i is claimed to be the next step in autonomous driving: a car that will not only drive itself, but that can perform extreme manoeuvres like drifting. This official BMW video shows the car drifting car with no input from the driver. BMW has shown a version of its forthcoming M235i coupe at the 2014 CES show which is capable of drifting with no input from the driver. 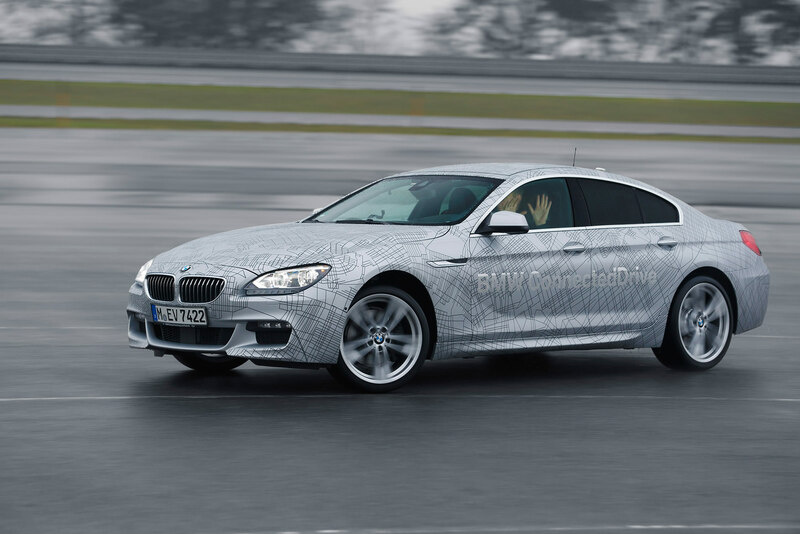 The research prototype demonstrates what BMW says is an essential component of autonomous driving – the ability to safely master extreme driving situations. This official video from BMW shows the M235i driving and drifting on track ahead of its CES reveal. Picking up your new BMW in Munich is the start of an unbelievable experience. The BMW Welt is home to automobile exhibitions, an automobile delivery center and an event hub all under one roof. Customers and visitors are provided with a closer-than-ever insight into all aspects of the BMW brand. A wide range of events and exhibitions housed in the striking double cone, automobile displays as well as impressive BMW technology and design exhibits ensure that a visit to BMW Welt is a day to remember. BMW has earned an undisputed status as one of the world’s leading carmakers with developments – grouped under the BMW ConnectedDrive banner – focusing on every aspect of the link-up between the driver, vehicle and outside world. The company is underlining its position in the vanguard of technology at the Consumer Electronics Show (CES) 2014 in Las Vegas. The company will use the headline US fair – which spotlights advances from across the world of digitalization and connectivity – to present innovative previews of future developments and new applications for series-produced vehicles. Highly automated driving at the limit. 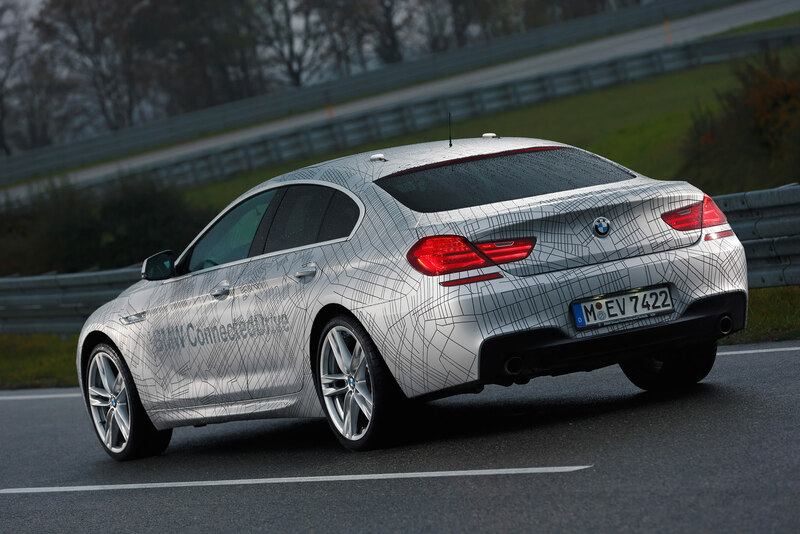 The BMW Group has created a new kind of research prototype for highly automated driving which uses advanced control technology to demonstrate maximum safety up to the car’s dynamic limit. 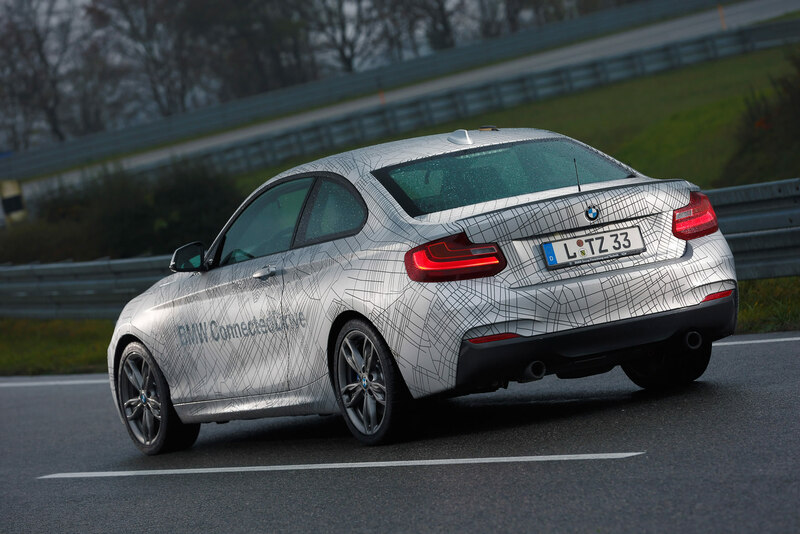 The BMW Group has created a new kind of research prototype for highly automated driving which uses advanced control technology to demonstrate maximum safety up to the car’s dynamic limit. In addition, the prototype vehicle will highlight the effectiveness of a new generation of control systems on the closed-off track. These systems actively intervene in the direction-changing decision-making process and ensure the electronically controlled steering works in perfect harmony with the brakes and accelerator. These systems go a crucial step further than current systems, which react to the onset of understeer or oversteer with carefully calculated braking inputs. 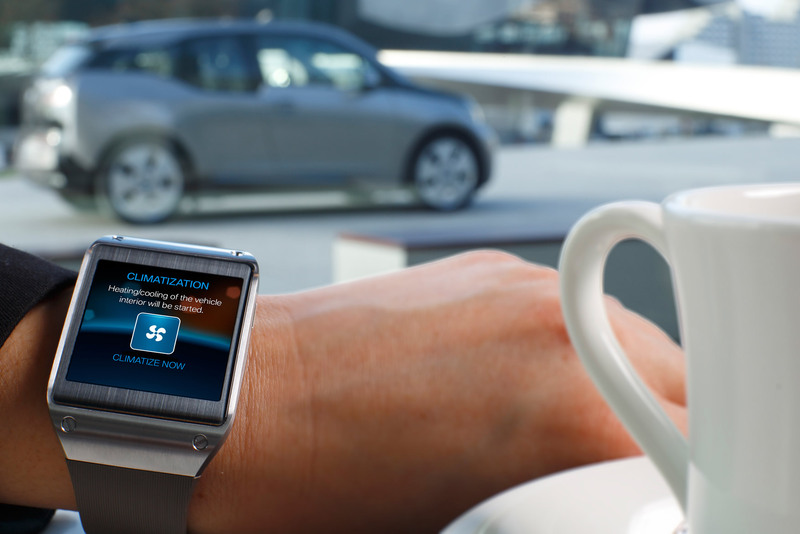 Special connection: BMW i3 and the Samsung Galaxy Gear. The rapid spread of smartphones means that the internet, apps and digital services have long since become established elements of daily life. Wearable devices like the new Samsung Galaxy Gear are driving this trend ever onwards. These devices are worn like wristwatches and display information from a linked smartphone directly onto the user’s wrist. 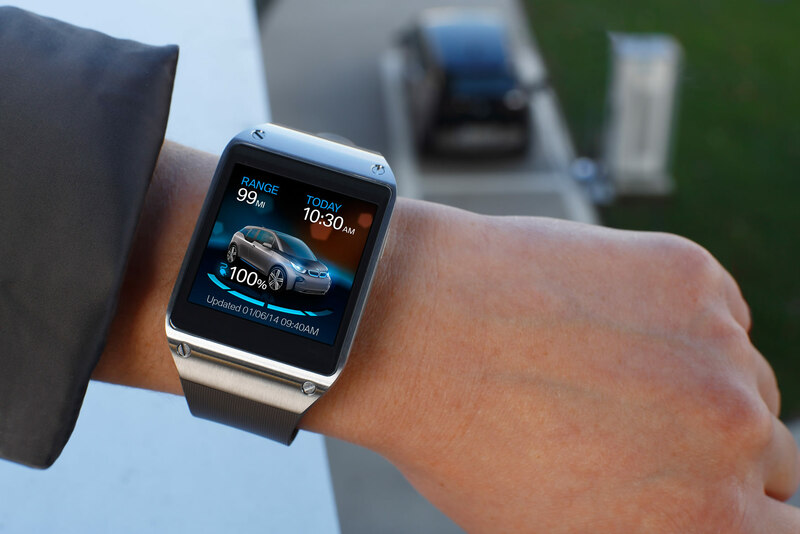 At CES 2014, BMW became the world’s first carmaker to present vehicle functions on the electronic wristwatch as part of a research application. 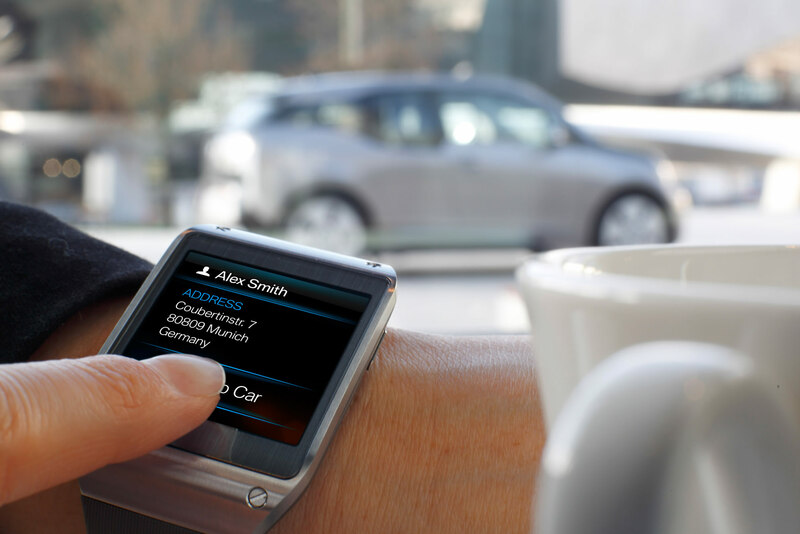 The Samsung Galaxy Gear with BMW i Remote App functions has similar attributes to the BMW i Remote App, which keeps drivers connected with their BMW i3 at all times. The app also works efficiently to provide drivers the assistance they need outside the car. 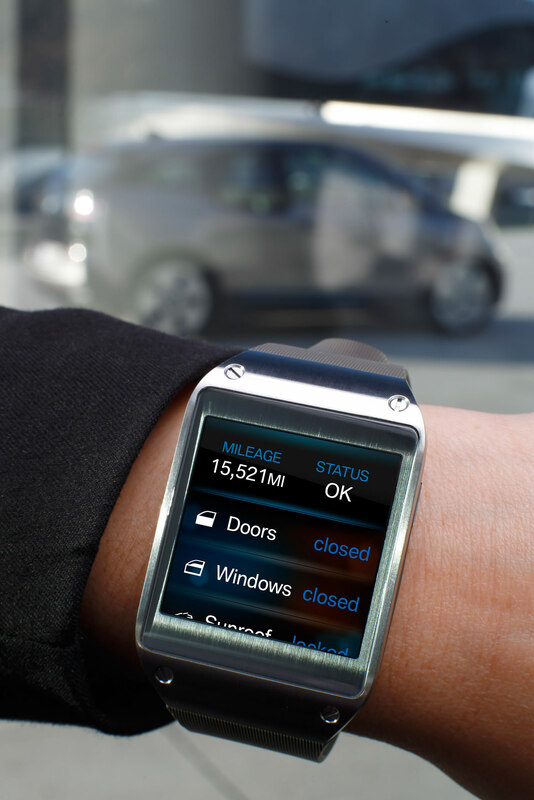 The Samsung Galaxy Gear with BMW i Remote App functions offers information on the battery charge and available range of the first all-electric premium model in the compact class, as well as any departure times that have been inputted. The research application also shows whether the windows, doors and sunroof are closed and gives users the option of sending a navigation destination to the vehicle and adjusting the interior temperature in preparation for a journey. Camera-based assistance systems bring enhanced safety into new vehicle classes. Advances in camera and video technology have allowed visual detection to serve as a basis for modern assistance systems for some time now. For example, series-produced cars are already available with a camera (mounted in the centre of the windscreen in the base of the rear-view mirror) which delivers data for the Lane Departure Warning and traffic sign recognition systems. The Collision Warning system and Pedestrian Warning with city braking function, Traffic Jam Assistant and camera-based Active Cruise Control with Stop & Go function work exclusively on the basis of visual detection. They dispense with additional and costly radar technology, but offer similar functions. These safety systems can therefore also be extended to vehicle classes where demand for sophisticated systems has traditionally been low. Modern camera-based systems have advantages over purely radar-based applications when it comes to recognition of stationary obstacles. A wide camera angle, moreover, enables reliable detection of objects pulling in or out at the edge of the driver’s field of vision. At the same time, however, camera-based systems do require certain light conditions. These systems are already enhancing safety in the innovative BMW i3, for example. New Parking Assistant with longitudinal and lateral guidance. The new Parking Assistant with longitudinal and lateral guidance offers customers significantly greater comfort and safety. Not only – as with existing systems – does it use ultrasound sensors to find parking spaces parallel to the road and take over the parking of the car via the electronically controlled steering (lateral guidance); the assistance system now also switches between the forward and reverse gears of the automatic gearbox and allows the car to pull away and brake automatically (longitudinal guidance). These functions are underpinned by an interface to the gearbox and the electronically controlled accelerator and brake pedal. All the driver has to do is hold down the button activating the new assistance system and monitor the automatic parking procedure. The functions of systems like the new Parking Assistant with longitudinal and lateral guidance and the Traffic Jam Assistant go much further than existing assistance functions designed to ease the strain on drivers at the wheel. With their range of part-automated functions, they already lighten the driver’s workload much more significantly than conventional systems. Highly automated vehicles, meanwhile, can take over more of the driver’s tasks at a given time. All the systems performing these partly automated and highly automated roles are grouped under the BMW ActiveAssist banner and form a new branch of technology within BMW ConnectedDrive.